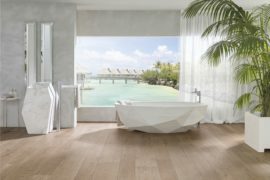 Last week we forgot it’s autumn and hopped on a plane to sunny Italy for Cersaie 2018 in Bologna, the world’s largest exhibition for ceramic tiles, furniture, bathroom and kitchen pieces; as well as cutting-edge building systems. 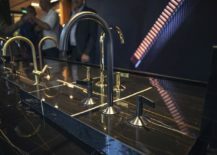 Porcelanosa have put on a great show presenting their newest collection of signature bathroom faucets by famous designer Ramon Esteve. Dubbed LIGNAGE, the new collections is a trip into the future, inspired by the inheritance of the past. See it all through our eyes and experience LIGNAGE in the video below. 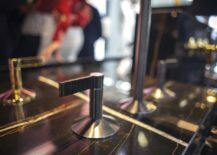 Ramon Esteve’s vision for Noken’s signature taps was a journey through time. 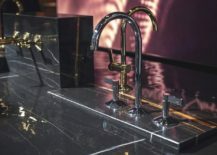 His savoir faire is a reinterpretation of the classic looks of taps with renewed aesthetic to further emphasize the legacy of the firm for the bathroom of the future. But the beauty of the LIGNAGE collection actually lies in its simplicity, uniqueness, and exquisiteness. 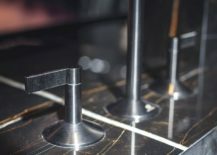 Single-lever, three-piece battery and a built-in three-piece battery are the formats available for the LIGNAGE collection. They all come in either chrome, gold gloss and brushed titanium — the last one being by far our favourite color. 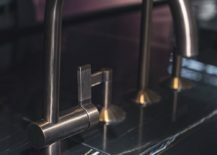 Last but not least we should tell you a little something about the handle on these faucets. 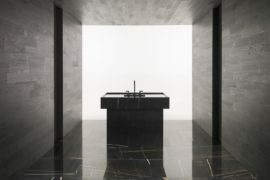 They all got the Valencian architect’s special touch by being either smooth or with textured finishes that are reminiscent to the old times while contemporary at the same time. 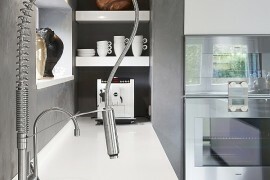 Alex Ion: Hello Ramon, congratulations on a beautiful new line of faucets for Noken. Can you tell us a few words about what defines Lignage. Ramon Esteve: Thank you very much for the interview. 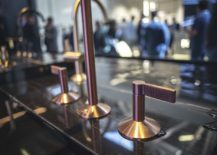 Lignage is a collection of faucets that is based in the sensation of the past. The idea is to understand the present and to research in the past to get the future. AI: And what are the things that inspired when you created this new line? 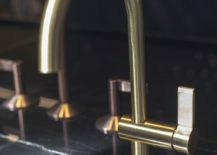 RE: I was inspired by the beginning of the faucets – around 19th century, the last years of the 19th century. 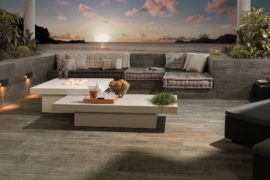 I create this new line to reproduce the sensation of the textures, also the mechanisms of the pipes and all the things that you can touch, things that you give feelings – special feelings. AI: The colors are truly exquisite, they are modern, they are classic. Which one is your favourite? RE: I like the mass finishes, for me it’s the most trendy. For me it’s the option that has more relation with the design of the product. 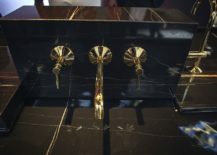 Also the bronze, and the gold is very elegant. AI: Desaign is not only about form, it’s also about emotion – the intesity of the emotion. 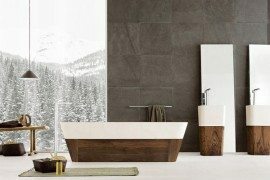 How do these design stand out for the bathroom of the future. 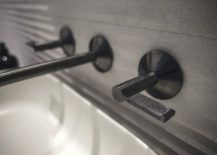 RE: I think the faucet is very modern but in the global concept of the bathroom. 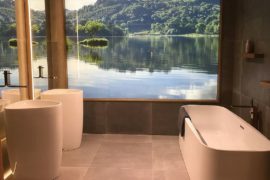 The bathroom now delimits from the rest of the spaces of the house, whereas it should be part of it and follow the same line of the house. 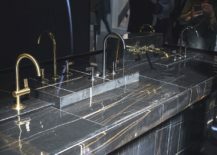 And the faucet is a compliment of the bathroom. AI: Last question I would say. 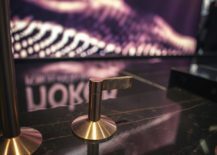 How would you define, what was your experience to design faucets for Noken. RE: This is very exciting, of course. 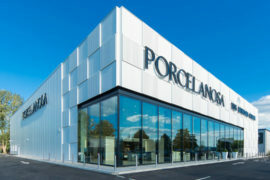 But I have a very good relation – old relation – with Porcelanosa. 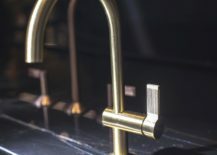 With Noken is the first time that I design the faucets. 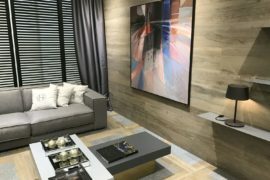 But I started collaborating for the premium collection, the high end products, to create a complete atmosphere around the design, around the experience and the sensations. And this is part of it. 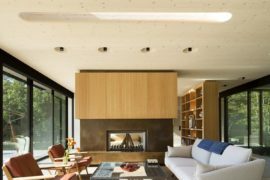 Check our gallery below and leave us your thoughts in the comment section below.